The golf courses at The Club at Mediterra (above, left) and Superstition Mountain G&CC are now showing the payoffs of carefully planned and implemented renovation projects. It’s one thing to make plans. It’s another to implement them. Just ask any superintendent who is overseeing a major golf course construction project. Whether a property is undergoing a complete renovation, restoring a layout to its original roots, or upgrading a specific feature such as bunkering, a project cannot succeed unless it is executed properly. At The Club at Mediterra in Naples, Fla., renovations at its two golf courses were part of an overall master plan that reaches out about 20 years. The project included completely regrassing the 36 holes on the property’s tees, fairways, and rough areas on its North and South courses with Platinum TE paspalum turfgrass. The renovation efforts also included new bunkering and the installation of a new irrigation system on each course at the private facility. Renovations to the South Course were undertaken in the summer of 2015, and the North Course renovation followed in the summer of 2016. Each project took about six months to complete. The courses were closed while they were being renovated, but golfers always had 18 holes to play. Throughout the renovation projects, maintenance needs continued at both courses. “At the closed course, we still had to mow grass in certain areas,” notes Director of Agronomy Tim Hiers. Kenosha (Wis.) Country Club is in the process of restoring its 18-hole, 1921 Donald Ross- designed golf course to its original intent. Kenosha’s greens, like many century-old putting surfaces, have shrunk over time, and strategic interest had been lost through the decades. Kenosha’s restoration project, which began in the fall of 2015, is being handled in phases, so the course can remain open throughout the process. The restoration includes multiple fairway and approach realignments and expansions, significant tree removal, permitting for several bridge relocations, and the reinstatement of the bunkers, various tees, and other elements. The greens and fairways are being replaced with new varieties of bentgrass, and surface reclamations and greens-collar expansions will affect all 18 putting surfaces. Kenosha CC also installed a new irrigation system, through a project that began in July of last year and was finished in November. During the upgrade, the main lines were installed, and then the heads. “We worked on one hole at a time, and we would close that hole,” says Certified Golf Course Superintendent Paul Bastron. During golf outings, however, the irrigation contractor would typically work outside of the 18 holes. Kenosha’s irrigation system, which accommodates the expansion of the fairways and greens, became operational in the spring. To date, most of the work has been done in-house. “The staff has really stepped up with the added work,” Bastron says. This summer, Kenosha CC started the addition of about 20 acres of native fescue areas on its property. “We’ve done some clearing on some hillsides to start putting in the fescue, and the areas will be seeded in the fall,” notes Bastron. Contractors started the shaping and restoration of about 33 fairway bunkers this summer as well, and the Kenosha maintenance staff is doing the drainage work and sand installation for the bunkers. Bastron expects the bunker work to be complete by the end of the summer. Bastron has also developed a turf nursery that will give the staff the ability to generate matched turf for modifications around the greens and areas where trees have been removed. Sometimes, just one feature of a golf course can require an upgrade, such as the bunkering at Superstition Mountain Golf & Country Club in Gold Canyon, Ariz. But a single-purpose project like that still can be a major undertaking. “The bunkers were our Achilles heel here for a few years,” says Director of Agronomy and Maintenance Scott Krout. Not anymore. Six acres of sod, 3,700 tons of bunker sand, 15,000 linear feet of drain pipe, 183,000 square feet of concrete, and 2,400 tons of capping sand later, the property has completed a massive overhaul of the 180 bunkers on its two 18-hole golf courses, Prospector and Lost Gold. The renovation started in mid-April 2017 and continued until its completion in mid-September 2017. “This was a project that the members were really looking forward to,” notes Krout. The renovations to the bunkers at Superstition Mountain on the two courses occurred simultaneously, switching from one layout to the other. Construction crews completely re vamped each bunker by removing existing sand, installing state-of-the-art Capillary Concrete, updating surrounding greens, and updating the drainage system. Although each hole required attention to its own characteristics, the bunkers on most of the holes were reshaped and reset to their original dimensions. Some were combined or separated into two smaller bunkers, to enhance playability. The property ultimately eliminated about 25 bunkers on the 36 holes, reducing their total square footage by about one- third, from six to four acres. The bunker floors on the Superstition courses were adjusted to improve drainage, and the surrounding slopes were increased or decreased to make the bunkers more accessible. Two decades of edging and play had affected the dimensions of the bunkers, so their outlines were reset to original specifications. The installation of Capillary Concrete, a patented sports-based drainage and hydrating material that can remove water and replenish moisture at the same time, has reinforced and defined the bunker outlines and is expected to control them for years. During the project, construction crews discovered blocked, crushed, or nonfunctioning drainage on a third of the bunkers. Because some of the bunkers are now shallower than they had been before, some shrubbery had to be moved from the line of sight. In areas where the bunkers could not be seen from the trees, some of the irrigation had to be moved. Areas in front of some of the trees also had to be cleared, to open up the views. “We had to adjust the landscaping to enhance the new bunkers so you could see them better,” explains Krout. During the project, the contractor painted the areas of construction around each bunker, stripped the sod from those areas, and dug out the old sand. The bunkers that were eliminated had to be filled in. The old drainage was removed, and the new drainage system was installed. Then the Capillary Concrete was installed on top of the drainage. Throughout the bunker renovations, Superstition Mountain’s members were able to play 18 holes of golf every day. Golfers had to play nines from each golf course during one two-week period, but the project was coordinated carefully to limit disruptions to play. “At no point in this entire process were members left with nowhere to play,” says Krout. 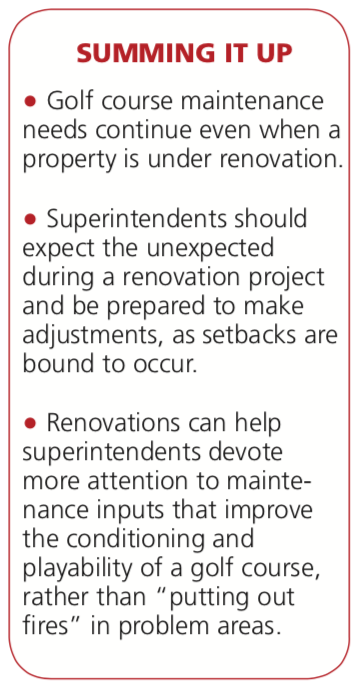 Despite planning for renovation projects for months or years before construction actually begins, superintendents know that Murphy’s Law is liable to creep into the process at some point: If something can go wrong, it will go wrong. But course-and- the bunkers, some of the surrounding sod began to brown during the heat of the summer. Unfortunately, some of the replacement sod to repair the damaged areas had to be sent back because it had started to turn brown as well. In addition, some of the concrete had to be reordered because it was not setting up or draining properly. Fortunately, however, other than one major monsoon near the end of the summer, Superstition Mountain had few weather issues during construction. In fact, the storm gave Krout insight into how well the new bunkers would hold up under heavy rains. However, Krout, who has been at Superstition Mountain since its first golf course was under construction in 1997, knew that patience would pay off to complete the renovation the right way. Hiers kept the club’s general manager and greens committee updated on the project as needed with texts, e-mails, and face-to-face conversations. “They were engaged, but they didn’t get involved in daily decisions,” he states. During the construction at Superstition Mountain, Krout’s primary role was one of quality control. He had to keep an eye on the progress to ensure that it was being performed up to specifications and that his staff would be able to maintain the bunkers. He also took regular tours of the golf courses with General Manager Mark Gurnow, Director of Golf Matt Brooks, and Golf Course Superintendent Lupe Ibanez. “After the project is done and the sand is in, we’re the ones that have to live with it,” Krout notes. And of course, ongoing course maintenance needs are likely to change after the completion of a project, making the subsequent post-renovation maintenance requirements an equally important concern for superintendents. The Platinum TE paspalum turgrass, which Hiers helped to develop, offers a number of maintenance benefits for the Mediterra staff. In addition to its excellent salt tolerance, the turfgrass has a high tolerance to cold, low light intensity or cloudy weather, and a vibrant rhizome system that recovers rapidly from divots. In addition, the deeper and higher mass root system uses water and nitrogen much more efficiently, which reduces maintenance costs. The fine leaf texture of the grass can handle a wide range of mowing heights, and its disease resistance helps superintendents reduce their use of turf-management products. While the additional acreage at Kenosha will increase mowing on greens and fairways, Bastron says, the tree removal has cut down on tree-related cleanup after storms. The Kenosha maintenance department has added a new fairway mower and a new approach mower to its fleet, to accommodate the expansion of the fairways and greens. The Kenosha maintenance department has also seen an increase of about 15 percent in its fertilizer and pesticide budget, because of the additional acreage. According to Bastron, the fairway surfaces will increase by about 30 percent, and the greens surfaces will increase by about 35 percent. “The restoration is secondary to the day-to-day conditioning,” he says. The new bunkers are now flatter, he notes, and that has helped from a maintenance standpoint, because they’re easier to maintain. “Now we’re spending our time raking and fine-tuning the bunkers, rather than trying to get the rocks out and get them to drain,” Krout says.